Whether you’re 5 or 50, investing in a straighter smile can help you enjoy better oral health in the future. At Vision Dental, our Menai family dentist, Dr Stephen Suster, offers a range of orthodontic services for patients of all ages. We use an orthopaedic growth modifying appliance as well as braces to develop the facial and jaw structures of our younger clients. This means that there is almost no need for extractions, and the end result produces not only a beautiful smile with straight teeth, but a full and balanced facial profile. To ensure a stable end result, we also work with an Oral Myologist to identify and eliminate the bad habit that has caused the problem. This could include functional habits such as incorrect tongue rest position, swallow, tongue thrusting, chewing patterns, lip seal and breathing which severely affect the growth and development of the jaw and face and the bite. Identifying the underlying cause of orthodontic problems ensures treatment is more effective. Investing in orthodontics and having your child’s smile evaluated at an early age can help your family avoid more expensive problems down the road. 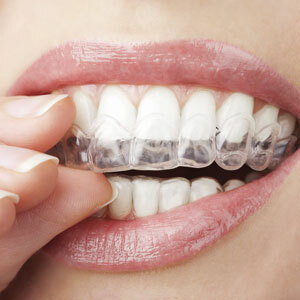 For adults and teens who prefer transparent braces without brackets and wires, Clear Correct is an excellent choice. The removable trays fit over the teeth, adjusting their alignment over time. Each one is custom-fitted and virtually invisible. Plus, they make it easier to enjoy meals and care for your teeth. Our Menai invisible braces patients take their Clear Correct aligners home with them, changing each set out every two weeks. Pop by our office once every six weeks or so for a quick check and to bring home your next set of aligners. An alternative to traditional braces, Rapid Smiles is a revolutionary system that straightens your smile in as quickly as 10 to 12 weeks. There are two options to choose from: one with clear brackets and tooth- coloured wires, and the second that uses braces fitted just behind the teeth. With a minimally visible and a completely invisible option available, Rapid Smiles is perfect for our patients who want to complete their treatment as quickly as possible. Which One Is Right for You or Your Child? Evaluating your smile is the first step to determining which type of braces will work best for your teeth. At Vision Dental, we offer convenient consultations at our Menai clinic for new patients. We also make orthodontic evaluations a part of your routine checkup, as your tooth alignment impacts your long-term dental health. Contact us today to schedule your free consultation. Be sure to ask about our 0% interest free financing and payment plan options.